$25 - a $5 Savings! Save $5 with the purchase of the Seven(7) tile Deluxe Fantasy Series Bundle! One(1) 10" x 16" full colour tile. The real politics of the Empire are not determined in the throne room or in parliament, but in the renowned Palace garden. Strolling along the manicured trees and perfumed flowers, with conversation masked by the running water of the fountains, kings, prime ministers, and diplomats negotiate treaties that will decide the course of many kingdoms. The garden has also been the scene of the occasional assassination of royal and elected officials. It has also served as a discreet meeting place for secret lovers. Here's an opportunity to have your characters use their charisma and social skills instead of swordplay and spells! 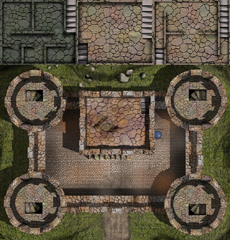 A refreshing change of location for your party of adventurers who are weary of one too many trips into slimy dungeons and dusty catacombs! Built by a forgotten civilization, this temple lay hidden for many centuries. What's the secret of its huge blue polished stone? And who (or what!) has been keeping the temple maintained and cleared from the vegetation of the encroaching forest? Two(2) 10" x 16" sheets and Three(3) 6" x 7" tiles come with this amazing castle set.